Clients can avail from us an extensive range of Acoustic Generator Canopies. Designed and developed by our highly skilled and knowledgeable professionals making use of supreme class components at par with the international standards, these products ensure high performance. The entire range of Acoustic Generator Canopies is highly demanded in market for its high strength, sturdy construction, corrosion resistance and extended durability. To meet the varied needs of clients, these products are offered in different specifications. 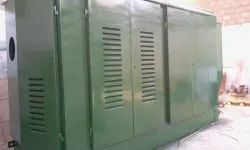 We are manufacture Generator Enclosures and Acoustic Enclosure which is designed in such a way to have optimized power presses. 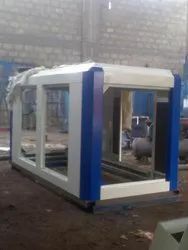 Our offered enclosure is available in various dimensions and sizes as per the client’s needs. We offer Compressor Canopies which are manufactured by high standard quality raw materials. We finished these Enclosures by proper designed by CAD/CAM through professional engineers. Dismantle design, Vibration Free, Flexible design, proper cooling system by Co-Axial flow fans with suitable residential silencer. Delcot offer our precious customers highly durable range of Compressor Sound Proof Canopies that is widely used to minimize noise. 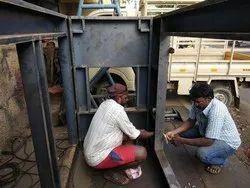 These enclosures are designed and manufactured by making use of supreme grade raw material with the help of latest technology at our sophisticated production set up. Prior to dispatch them from our end, the offered Compressors Acoustic Enclosures undergo quality tests to ensure their flawlessness. Further, provided enclosures are made available in various designs and sizes at nominal prices. These enclosures are maintenance free and can last for a long time. This allows users to save quite a good amount of money, which they can invest somewhere else. Over the last few years a huge development in the manufacturing of these enclosures has made them more impeccable and maintenance free. 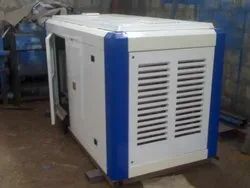 Effective service: The Acoustic Enclosure is designed to minimize the emitted noise from the Compressors as much as possible.we are manufactured in such a way that clients can have the desired service for a long time. It is to be kept in mind that different types of Compressors emit different levels of noise and so it is important for users to select the best product that would offer the most effective service. The Enclosure is fabricated out of and 16/18 gauge thick cold rolled cold annealed (CRCA) sheet or GI sheet. Base Frame is made of ISMC/CRCA of suitable section sheet metal. Durable industrial locking system is provided on doors. Doors and panels are fitted with high quality EDPN Gasket. Rock wool is fire resistive covered with perforated sheet and Protective Tissue paper. And the further outside secured with cover sheet. 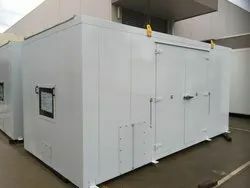 A compact structure and strong soundproof enclosure with elegant appearance, is easy to be assembled or disassembled and reduces noise effectively. Famous brand engine can be chosen by buyer. The running is reliable. 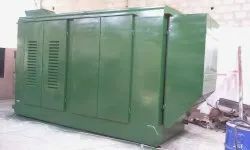 In today's world not only the government but individuals too are extremely worried about the environment, from our side we have designed and developed a wide array of sound proof canopies for generators, which are designed for practically all dimensions. They are of excellent quality and can be designed as per the international standards. 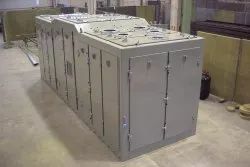 We are designed removable steel enclosures for noise attenuation for gen set, our enclosures specification are bellow 75 dbA (decibel) to meet concerns of our clients our enclosures are quitter more than 80% before the Installation. 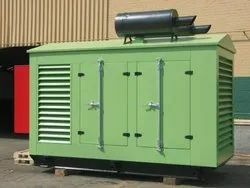 Our companies such as dresser, roots have utilized our packages for their genset it is flexible in design easy to remove panels during maintenance it is very compact durability. Sturdy tubular design frame slip to together with care. It protects electrical equipments and alternators from all weathers. Our painting processor protects the metal from break trust. Significant high level sound reduction. 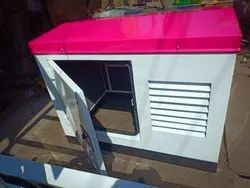 It is dismantlable, design, removal design, easy storage and modular is construction. Looking for Soundproof Generator Canopy ?